2019 UPDATE: If you want an amazing new long term time lapse camera perfect for 3D printing projects, please check out the Afidus ATL-200 at www.AfidusCam.com. We also have a web site dedicated to sales and support of time lapse cameras at www.TimeLapseCameras.com. Customer care is very important to us and we are here to ensure your time lapse project is a success. We made an exiting discovery at the 2015 Consumer Electronics Show (CES) in Las Vegas. Time lapse videos of 3D printing projects are very popular, turning projects which take hours or days to print into interesting and compelling short movies. 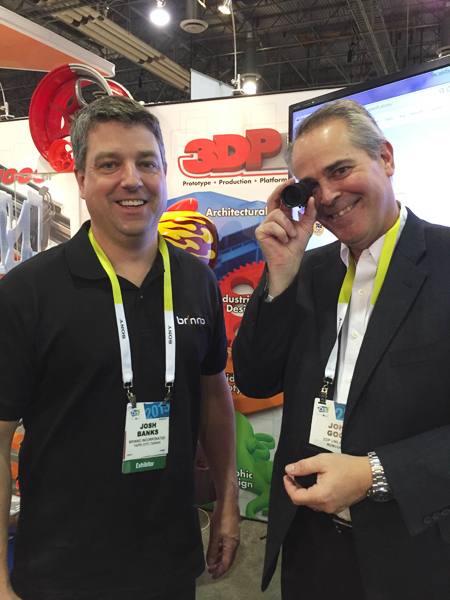 We at BrinnoUSA are here to support the 3D printing industry. Josh Banks, our Authorized Solutions Provider, spent a good portion of his time in the Sands Expo Center discussing the Brinno time lapse solution with people in the 3D Printing Industry. One of the biggest discoveries was 3DP Unlimited's amazing use of our cameras to create, their show video. 3DP Unlimited used the Brinno TLC 200 Pro camera which worked perfectly for their needs. Recording a 400 hour print, nonstop, unattended with simplicity not found in other solutions. 3DP wants to experiment more with the Brinno cameras which resulted in Josh presenting 3DP Vice President of Sales & Marketing, John Good, with a Brinno 18-55mm lens which will be great for undistorted close-up work. In a conversation with Kyla from Solidoodle, Josh showed her the camera and explained the capabilities. Josh asked, if she was interested in the camera, her reply, "everyone in here would be interested in this camera." All of this came about, when Josh had a flight to Vegas with the Spectrom team. What started off as casual CES conversation brought the two technologies together. Josh spent some time with Spectrom at CES and even continued the discussions when they shared the same flight home. For all of the information and future potential, Josh presented Chase Haider, Co-founder of Spectrom, with a Brinno TLC 200 Pro of their own. The Brinno TLC 200 Pro is our camera recommendation for 3D printing and is available from Amazon, B&H and others listed in the Retailers section. With all we have learned at CES, we are excited to provide you with a great solution for your 3D printing time lapse needs. Here is a Brinno camera 3D printing time lapse informational video.